We talk a lot about the next generation of farmers and what the future will look like for them. If the current situation is any indication, farming and ranching will carry on for many years. 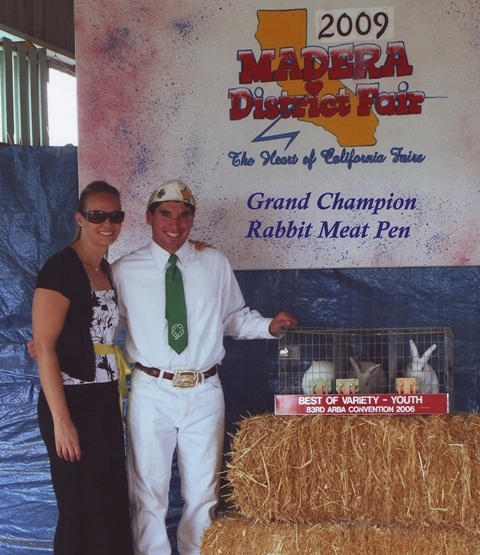 The Madera District Fair September 9-12, 2010.is a great place to witness the hard work of these budding agriculturalists. Our local County Fair means something different for everyone. For some, it is an entertainment venue with rides, corn dogs, funnel cakes and great concerts. County Fairs have always been about agricultural pride and exhibition. Watson’s model for agricultural fairs was widely adopted, but they often faced financial difficulties. During the 1820s and 1830’s local fairs floundered because private donations fell short of the money required for premiums, fair grounds, judges, transportation, publicity, and entertainment. Beginning 1840, however, state legislatures across the country formed agricultural boards and allocated funds to agricultural societies, which in turn allowed for larger, more regular exhibitions. In 1841, the first state fair took place in Syracuse, New York. The three-day event attracted more than 15,000 people and was sponsored by the New York Agricultural Society. Today, the California Department of Fairs and Expositions is housed in the California Department of Food and Agriculture. Fairs quickly became highly anticipated events across the country. Many farm families adjusted their work schedules as far as a month in advance of the big events in order to earn a few work-free days at the fair. For many people, the fair would be the first time they saw electric lights and airplanes, and it helped farm families adapt to changing social ideals and introduced them to new forms of entertainment. In the 1850s and 1860s women saw sewing and washing machines, a printing press, and stereoscopic pictures for the first time at the local county fair. The Livestock Sale at the Madera District Fair is on Saturday, September 11th at 12:30pm. Anyone who has raised an animal for sale knows that it is a job that is never completed. Animals need many hours and untold amounts of care to stay healthy. It is our duty to support them by attending the Livestock Sale and bidding to buy one of these animals. To be a buyer, one must register by going to the Madera Fair office before the sale, or by registering the day of the sale at the “VIB” (Very Important Buyer) Tent near the beef show ring. When you register to be a buyer, you will be invited to the Buyer’s Luncheon at 11:00am before the Auction begins at 12:30 Saturday afternoon. Entry Ticket to the Fair: General – $8.00; Senior Citizens – $ 4.00; Children 6-12yrs – $4.00; 5 yrs and younger – ADMISSION FREE. Call (559) 674-8511 for more information or visit www.maderafair.com for concert tickets and pricing.